The new US secretary of state, Condoleezza Rice, is a close friend of President Bush and his former foreign policy tutor. The 50-year-old is renowned for her intellect and her passion for football. She is also an accomplished classical pianist. Below are a selection of her own comments on subjects as diverse as Baghdad and Brahms. It's just nonsense to say that because we've confronted it [the terrorist threat], we've created more of it. Does anybody think these people were just sitting around drinking tea? There will always be some uncertainty about how quickly [Saddam Hussein] can acquire nuclear weapons. But we don't want the smoking gun to be a mushroom cloud. We do need to remind everybody that tyrants don't respond to any kind of appeasement. Tyrants don't respond to negotiation. Tyrants respond to toughness. And that was true in the 1930s and 1940s when we failed to respond to tyranny, and it is true today. The truth of the matter is that repeated directors of central intelligence, repeated reports by intelligence agencies around the world, repeated reports by United Nations inspectors asking hard questions of Saddam Hussein, and tremendous efforts by this regime to conceal and hide what it was doing, clearly give a picture of a regime that had weapons of mass destruction and was determined to conceal them. The people of the Middle East share the desire for freedom. We have an opportunity - and an obligation - to help them turn this desire into reality. And we must work with others to create a world where terror is shunned and hope is the provenance of every living human. That is the security challenge, and moral mission, of our time. 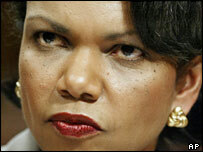 Ms Rice has said that her dream job is commissioner of the National Football League. I think it would be a very interesting job because I actually think football, with all due respect to baseball, is a kind of national pastime that brings people together across social lines, across racial lines. And I think it's an important American institution. I really consider myself a student of the game. I find the strategy and tactics absolutely fascinating. I find the evolution of the game really interesting. Again, as it relates to military history. Military history has swung back and forth between advantage to the offence and advantage to the defence. When the offence has the advantage, then a new technology will come along that will temporarily give the defence the advantage and vice versa. Football has that kind of pattern, too. After a brief flirtation with the Democratic party Ms Rice became a Republican. I found a party that sees me as an individual, not as part of a group... In America, with education and hard work, it really does not matter where you come from - it matters where you are going. Birmingham [Alabama] was odd. It was completely segregated. But the black community built its own world. I went to ballet classes and took French lessons and etiquette classes. My father had a picture of me when I was about four sitting on Santa Claus's lap and I have this really odd look on my face, and I wonder if that's because I'd never been that close to a white person before. I was going to be so well prepared. And I was going to do all of these things that were revered in white society so well, that I would be armoured somehow from racism. I would be able to confront white society on its own terms. My family is third- generation college-educated. I should've gotten to where I am. I love Brahms because Brahms is actually structured. And he's passionate without being sentimental. I don't like sentimental music, so I tend not to like Liszt, and I don't actually much care for the Russian romantics Tchaikovsky and Rachmaninoff, where it's all on the sleeve. With Brahms it's restrained, and there's a sense of tension that never resolves.